A mother’s day weekend event during which MVHS sells herbal plants and shares knowledge about growing and using herbs. A Sunday afternoon when MVHS members welcome the public for tours of the herb garden. A weekend sale of herbal products, crafts, blends, baked goods, and gifts. Also a fundraiser. Planning, planting, maintaining the herb garden at Toledo Botanical Garden weekly during the growing season. We believe that active participation benefits not only the Society in meetings its goals, but the individual who expresses interest in learning about herbs by joining the organization. 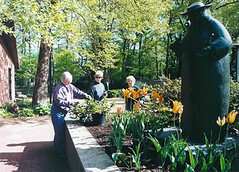 Anne, Maj, Sally working in the MVHS herb garden at the Toledo Botanical Garden.